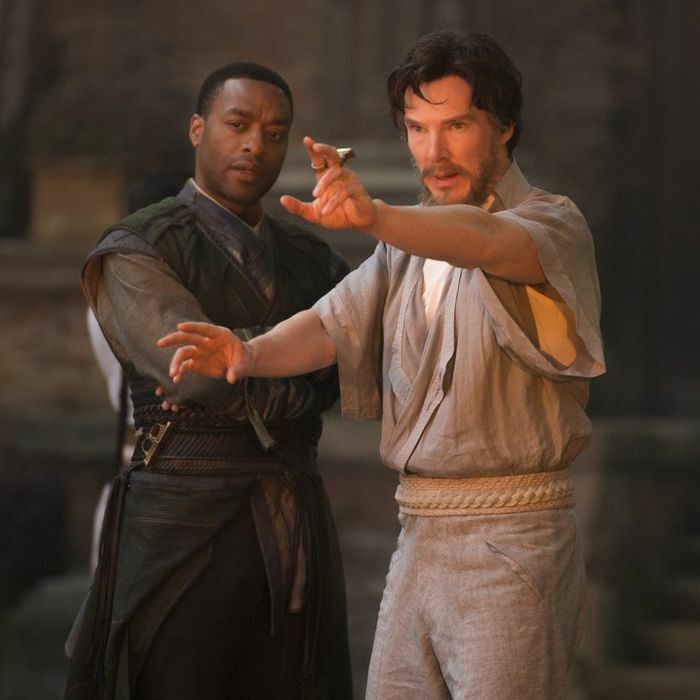 Chiwetel Ejiofor and Benedict Cumberbatch in Doctor Strange. No executive in Hollywood wields more casting power than Kevin Feige. The 43-year-old president of Marvel Studios, Feige can anoint a brand-new A-lister simply by casting an actor as one of his high-profile superheroes, and since the characters crisscross through each other’s films — and, in the case of Chadwick Boseman’s Black Panther, were cast even before a director was picked to helm the character’s stand-alone installment — Feige’s selections carry outsize importance and are heavily scrutinized. In some ways, Marvel’s latest movie, Doctor Strange, is the culmination of the studio’s increased casting clout: Stocked with tony actors like Benedict Cumberbatch, Chiwetel Ejiofor, and Tilda Swinton, it could read like the call sheet for an awards-season vehicle instead of a reality-bending superhero origin story. That said, the casting has been the subject of controversy, since Feige and director Scott Derrickson took the character of the Ancient One — in the comics, an elderly Asian man who dispenses wisdom to the white title character — and rewrote the role into a Celtic woman played by Swinton. The move was meant to make an end-run around what could have been a stereotypical character, but with so few major roles for Asian talent on the big screen, the revision carried with it brand-new complications. Still, Feige is listening to the criticism, and as he told Vulture last week, he’s bullish on the increased diversification of the Marvel universe to come. In Strange, the traditionally white role of Mordo was cast with black actor Ejiofor, and the next four Marvel movies feature female leads and love interests played by women of color, including Zoe Saldana in Guardians of the Galaxy Vol. 2, Zendaya in Spider-Man: Homecoming, Tessa Thompson in Thor: Ragnarok, and Lupita Nyong’o in Black Panther. Compare that to the usual superhero casting shortlists — like the many white women vying to play Domino in the soon-to-shoot Deadpool sequel — and it feels like incremental but notable progress. Feige sees Spider-Man: Homecoming as a major step forward on that front. While other Spider-Man films have been set in a lily-white Queens high school, the Jon Watts–directed Homecoming surrounds Tom Holland’s Peter Parker with a much more diverse cast including Tony Revolori, Jacob Batalon, Donald Glover, and two potential love interests played by black actresses: Laura Harrier as Liz Allan and Zendaya as a character rumored to be iconic Spider-Man love interest Mary Jane.